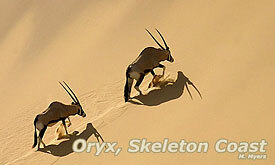 Damaraland with the rugged beauty of its landscape is a region of rolling plains and distant mountain ranges. 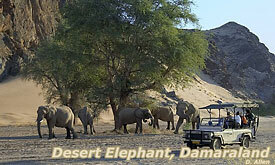 Unusual geological features, a wealth of rock paintings and engravings, and populations of desert-adapted elephants and black rhino combine to form the unique attraction of Damaraland. 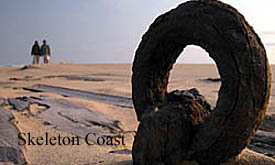 Another point of interest in the region is the Petrified Forest. Here some antediluvian flood deposited giant treetrunks, some up to 30 m long. The age of these fossil trunks is estimated to be 200 million years. A short drive from the Petrified Forest is Twyfelfontein which is unequalled for its abundance of rock engravings set in a U-shaped valley of unusual reddish sandstone formations and terraces. 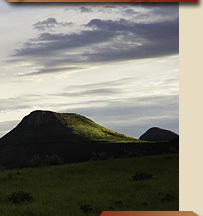 Please choose from one of the safari packages below, or CONTACT US for a more personalized itinerary. Fly in safari package offering 2 nights at Kulala Desert Lodge + 2 nights at Damaraland Camp + 2 nights at Ongava Lodge, all meals, all scheduled safari activities, local brand beverages, park entry fees all air transfers from/to Windhoek, Airport departure tax. 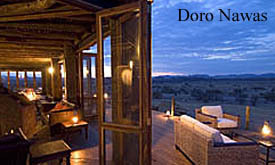 Fly in safari package offering 2 nights at Kulala Desert Lodge + 2 nights at Doro Nawas Camp (Damaraland) + 2 nights at Andersons Camp (Etosha), dinner, bed & breakfast basis, a air transfers from/to Windhoek, Airport departure tax. 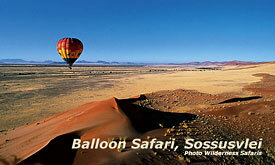 Fly in OR Self Drive safari package offering 4 nights at Sossusvlei Desert Lodge, all meals, all scheduled safari activities, Local brand beverages, park entry fees all necessary air and road transfers from/to Windhoek, Airport departure tax. 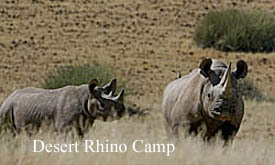 Self drive option include 5 days Group A car rental, pick up and drop off Windhoek Int. Airport, instead of the air transfers. 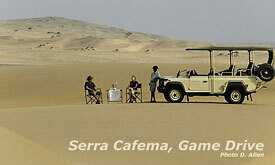 Fly in safari package offering 4 OR 5 nights at Hoanib Skeleton Coast Camp all meals, all scheduled safari activities, local brand beverages, park entry fees, air transfers from/to Windhoek, Airport departure tax. 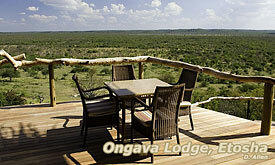 Fly in safari package offering 4 nights at Ongava Lodge, Etosha National Park,all meals, all scheduled safari activities, local brand beverages, park entry fees, Air Charter Transfers from Windhoek Airport Departure Tax. PRICED from R 18,300.00 per person sharing. Fly in safari package offering 2 nights at Kulala Desert Lodge + 2 nights at Ongava Lodge ,all meals, all scheduled safari activities, local brand beverages, park entry fees, Air Charter Transfers from Windhoek Airport Departure Tax. 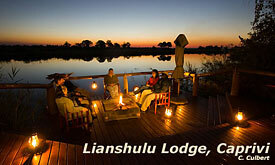 PRICED from R 21,260.00 per person sharing. Fly in safari package offering 2 nights at Kulala Desert Lodge + 2 nights at Swakopmund Hotel & Entertainment Center + 2 nights at Doro Nawas (Damaraland) + 2 nights at Anderssons Camp (Etosha), Air Charter Transfers from and to Windhoek Airport, Departure Tax. PRICED from R 37,200.00 per person sharing. 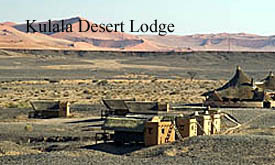 Fly in safari package offering 2 nights at Kulala Desert Lodge + 2 nights Damaraland Camp + 2 nights at Ongava Lodge + 2 nights at Camp Okavango + 2 nights at Camp Moremi + 2 nights at Chobe Game Lodge + 2 nights at the Royal Livingstone Hotel on the Zambian side of Victoria Falls, Air Charter Transfers from and to Windhoek Airport, Departure Tax.